I write this story not only with a heavy heart, but also with hope. A year ago, Gino was diagnosed with ALS (Amyotrophic lateral sclerosis), also known as Lou Gehrig’s disease. I know the date was November 14th and if you wanted the time, down to the second, I could tell you; when life changes, time stands still and imprints itself on a heart. We sat and listened to a doctor deliver news no one wants to hear; I saw Gino, at 49, realize the weight of words. ­­The questions that ran through our heads, as we tried to process what we heard, came out as if they were one stream of (un)consciousness. The denials hit first. Couldn’t be. Are you sure? Something else, surely––something you can treat and heal? Gino’s health is his livelihood and his passion. As a tennis pro, a Marathoner––Boston six times, New York two times––and Philadelphia, Love Runs, and others in cities too numerous to remember and count––he made his strides. Before running, he was a biker; before biking, soccer owned his time. But, tennis throughout his life, defined his success. 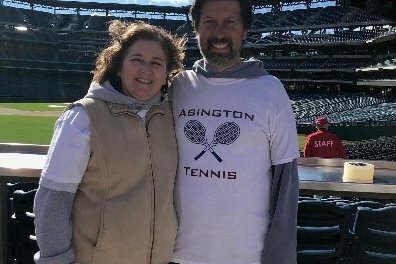 I know Gino prides himself on being a “playing tennis coach.” His years of competitive play provide perspectives and strategies that are invaluable to his students. As an athlete, he respected his body and was motivated to take care of himself. At that fateful appointment, our hands went from opened pleading to a prayerful press as we sat and listened to the doctor describe our new truths. ALS is a hideous disease; it does not rest. It worms its way through the body in idiosyncratic and insidious ways––and this reality is different in every patient. In the year since diagnosis, its progression in Gino is sadly evident. Yet, he awakens each day feeling lucky to be able to do so. While he is still able to teach tennis some, playing days, marathons, and sports that brought him pride and joy, are over. His days are shorter, as energy is sapped, his speech is a bit slurred, and swallowing is sometimes a struggle; it was so easy to take for granted the energy he had. 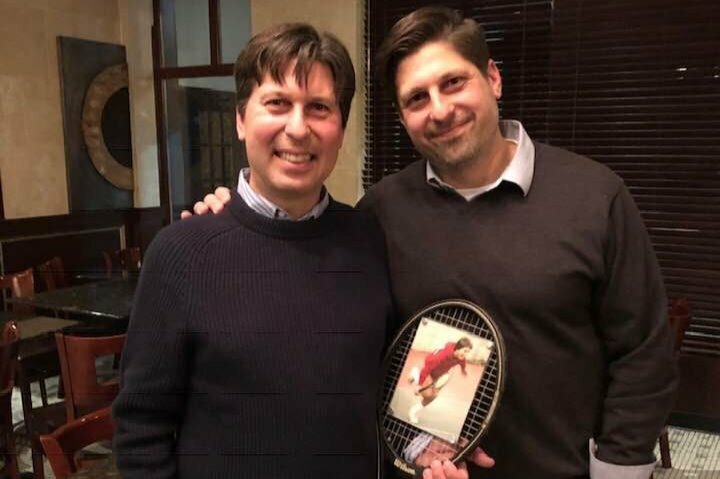 Now, he does what he can and we are grateful and blessed by Nassau Tennis Club in Princeton, NJ; the club owners and Gino’s colleagues have been amazingly supportive of Gino, respecting his appointments, tests, and growing fatigue. ALS survival rates vary from patient-to-patient and this reality is what perplexes doctors and researchers. While we are praying Gino is on the “20-year plan”––blessed with years similar to Dr. Stephen Hawking ––we can only hope. Our focus now is on how best to adjust our lives to ensure Gino lives happily and safely. We will need to modify our home to add a 1st floor bedroom and bathroom (both handicap accessible), widen doorways to allow for wheelchair access, and add ramps to exterior doors, in light of the progressive state of his disease. To allow for proper transportation, a handicap accessible van, and adaptive and assistive equipment to aid in getting Gino in and out of it, as well as in and out of chairs and a bed, are necessities. Eventually, home healthcare providers will be essential so that I (Maria) can continue to work, ensuring continued medical insurance coverage. We have been advised that there is more equipment that will be vital to his care, but it is too numerous to mention. Medical bills and co-pays continue to rise and heighten and magnify the stress of the situation. With an enormous amount of humility, we have come to the point that we must ask for help. Please know we consider ourselves the unluckiest, luckiest people in the world. This has not been our first descent into managing serious illness. Having faced and managed cancer––twice––with numerous recurrence scares and infections, we know we would never play the “Why me/us?” card. We have taken each challenge as a team, and kept the every day challenges that other working, middle-class families and parents face in perspective. We have been truly blessed and lucky to have support and prayers from amazing family members and the best, most generous network of friends anyone could wish for. This event, though, feels a little different, and while we know we will face the challenges, we know we will need more prayers and more assistance. 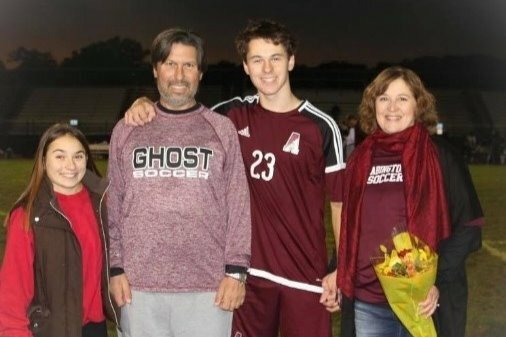 ALS is also known as the “bankruptcy disease.” The financial challenges of caring for a loved one with ALS are astronomical, even with the best of insurance. Things we know are in our future––many of the necessities for Gino’s care––are not, and will not be, covered. Just as we were devastated by Gino’s diagnosis, we are now devastated to be seeking financial assistance like this. It is time for us to put our pride aside and ask for help. 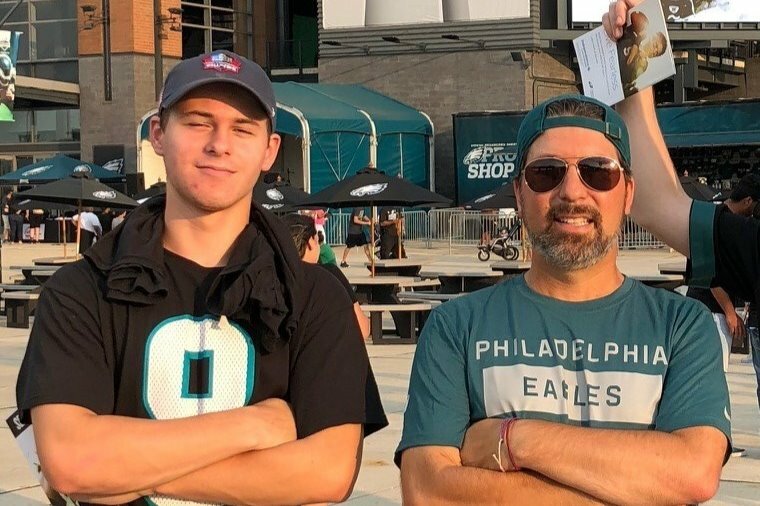 We pledge all funds raised will be separately administered in an account dedicated exclusively to care for Gino­––including, but not limited to, what we have mentioned above. If you stayed with us “this long” in reading our story, please know we finish it as we started, it is with both heavy hearts and hopeful ones that we extend thank you to each of you––for your support in friendship, for your prayers, for your guidance, and broad shoulders to help us manage the weight of this reality. We believe in the power of prayer and positivity. 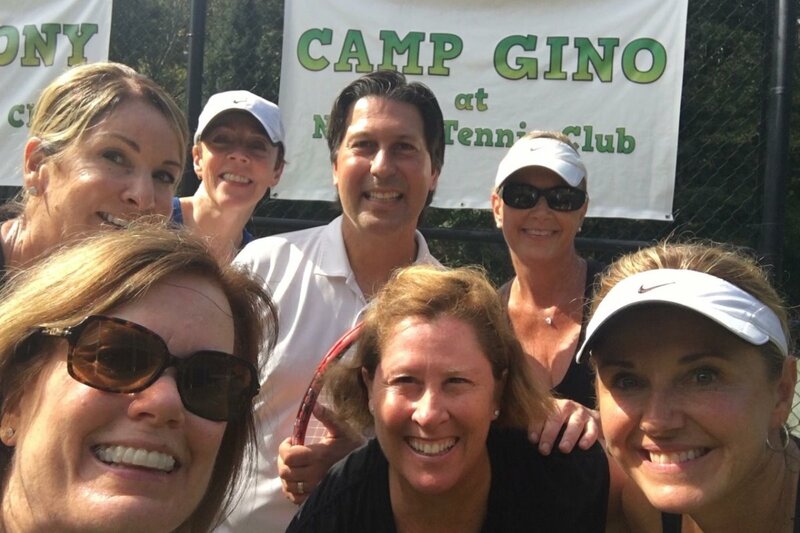 We are excited to share with you a wonderful event organized by many new friends of Gino's Match Against ALS. "Gino's Jog" is a 5k/10k fundraising event on May 11th in Wissahickon Park. Below is a link to sign up. This event combines two of Gino's loves … RUNNING and RUNNING in Wissahickon Park. Gino spent many, many hours running many, many miles in that beautiful park. Many of those hours and miles were logged with his running buddies in the photo above. Please join us if you can for some fun (definitely) in the sun (hopefully) on May 11th. Thank you for your continued support and well wishes. 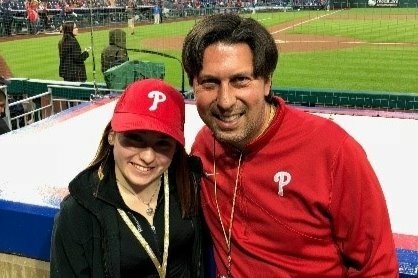 Here's to Gino's 20 Year Plan! No White Flags! xoxo, M.
As many of you may know, Gino turns 50 on February 14th. Valentine’s Day! 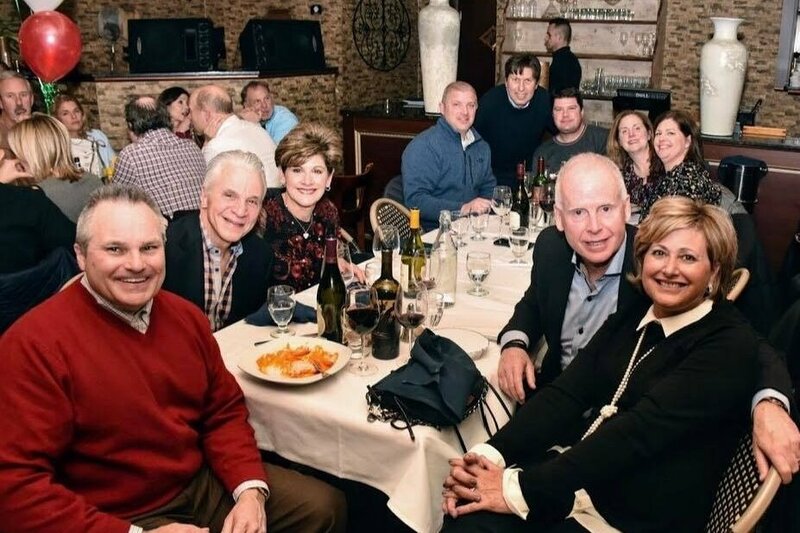 Many friends once again took charge and put together quite a special celebration for Gino. 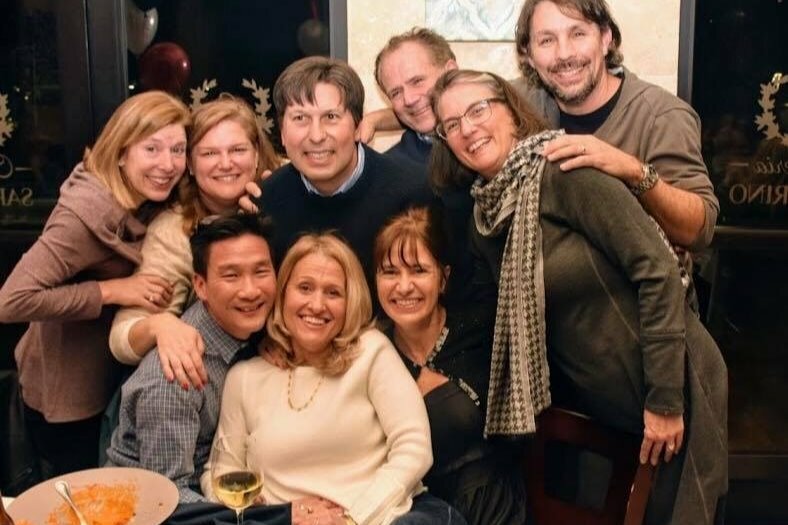 On Saturday, February 2nd, about 140+ friends and family gathered and gave Gino quite the surprise! 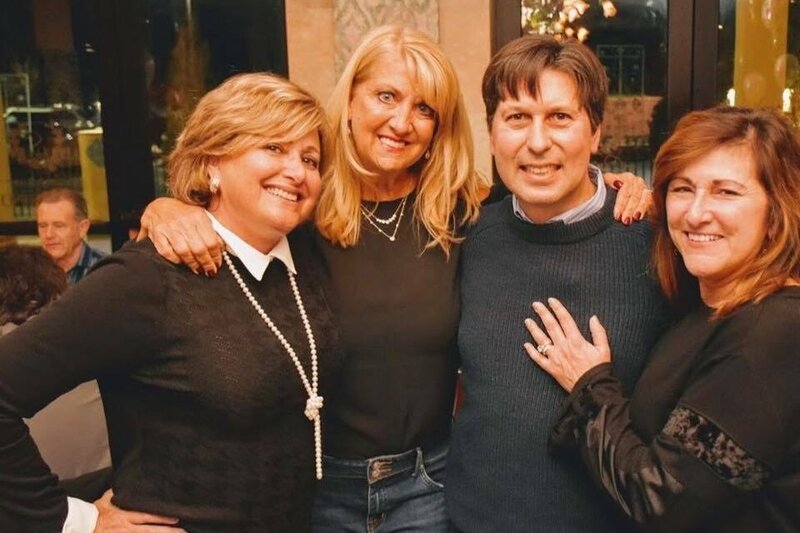 There were family and friends from every part of Gino’s life. Childhood buddies with whom Gino played in the neighborhood sitting next to teaching buddies from his earliest days of teaching at Cheltenham. There were current friends and lessons who drove down from the Princeton area meeting and sharing stories with old, dear friends and lessons from the Cheltenham days. There were neighborhood friends for whom a snow day means shoveling followed by wings and beers at UJs, to friends we have made through our children’s various sports and school activities. There were our life-long, dear friends from high school with whom weddings, baby showers, and other surprise 50th birthdays were planned. 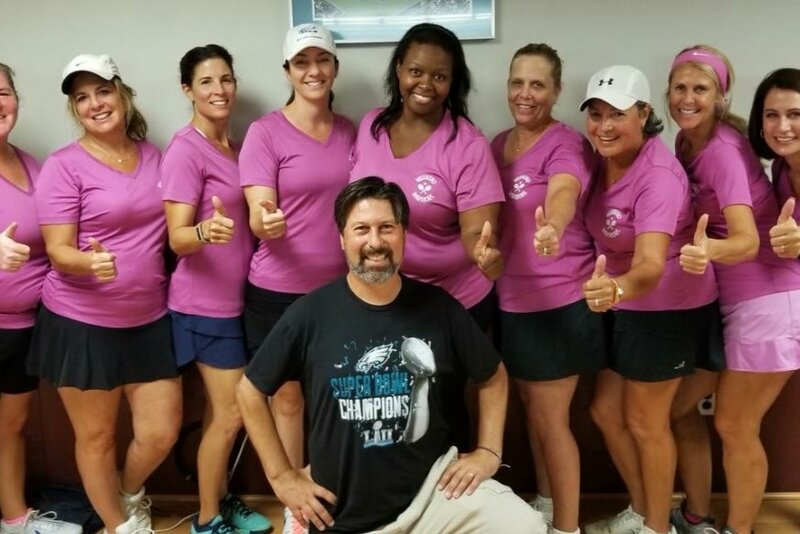 Stories were told about running through the creeks and parks of Huntingdon Valley and Forbidden Drive, to “war” stories about matches won and lost at various USTA and Nationals tournaments. I will never know how they remember exact points from matches that occurred many years ago!  In his own words, Gino was “flabbergasted” at the outpouring of love that evening. It was a truly special, special night. Thank you to Nancy and Andrea for putting it all together and to everyone who played a role in those plans. Thank you to everyone who was able to attend and thank you so very, very much for all the generous gifts and cards. Once again, words cannot describe our level of gratitude. You will all be in our thoughts and prayers forever. We can only post 3 photos with each update. Unfortunate in this case because there are so many wonderful photos from which to choose. As we sit on the couch this Christmas Eve morning, before the rush of final shopping and wrapping begins, we are once again humbled by the love and support showered upon us by so many family, friends and strangers. Yes, people we do not even know have supported us through our page and have commented on our story. We have received donations from 311 generous souls, and the total donations now soar above $50,000. This is amazing! Our story has been shared 621 times! As a result, we now hear from folks who have never met us but who want to come to our aid. Although we have not seen all 621 shares, we have seen a few, many of which were accompanied by beautiful, heartfelt messages on our behalf from those who were sharing our story. With the help of our friends and family and now NEW friends, our spirits are lifted, our fears about the future are a bit less, and our hopes soar. We are not alone in this battle, of this we are sure. Thank you! We continue to be humbled by the incredible love and support from so many family, friends, and new friends … folks we did not even know before sharing our story. Thank you!!! And the expressions of love and support … your kind words and shared memories are "the wind beneath our wings." Thank you!!! We wanted to let you know what we have been able to accomplish in the last few weeks with your help and with the expertise and guidance of some very special friends. Gino's childhood friend Todd has been tremendous in helping us and leading us through the planning and process of home modifications. We are truly blessed to have him in our lives. He connected us with a wonderful, caring architect who actually likes the "oldness" of our home. She has developed beautiful plans which will give us the space necessary to ensure Gino is happy and safe for the 20 Year Plan. And the tennis world continues to be prominent in all of these efforts … we are working with a builder who is a friend and lesson from Gino's early teaching days. We will continue to update you on the plans as they unfold. While writing this we noticed the common theme of "friends", both old and new. 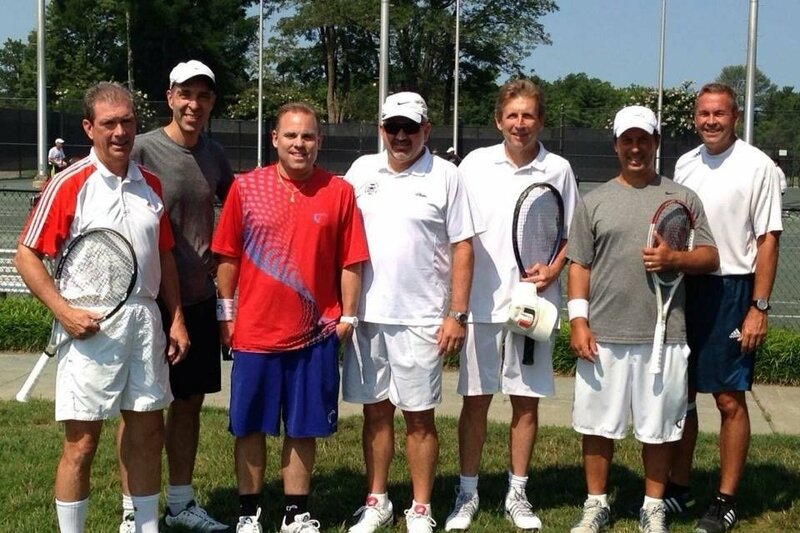 So, we thought we would share a few photos of some of our dear tennis friends. Thank you all so very much. We wish you a Joyous Holiday Season and a Happy and Healthy New Year!